A pit yard now flattened leaving a clear roadside view of the farm and warren is 21st century Annesley, on this cold and wet last day of November 2009 I only see three chimneys in the Rows producing smoke. No explanation needed that old King Coal does not reign here anymore. The next step or the last piece of history of our industrial bygones is on the social and probably most important side of the community. To locals it is/was known as the Welfare. This being the Miners Welfare Institute, to strangers every pit had a Welfare Club and grounds where drinking and sports took pride of place. I will try to tell you my thoughts and experiences of Annesley Miners Welfare. Very early on in our lives as Miners children we would have a Christmas treat to beat any modern day trips to Lapland. The Welfare Party, as it was known. All us kids in Annesley Rows were spruced up, best clothes and Brylcreemed hair to attend a great feast. The venue was the Welfare Hall (dance hall). Tables and chairs laid out in two big lines bigger than any birthday party. Food came along with drinks and no parents telling you what you should eat first, this was heaven on earth. After the party time to slide about on the hardwood floor while grown ups cleared our mess up, then the room was set out for the picture show. Unlike the Byron Picture house in Hucknall we all sat in lines on the dance floor while the films were projected onto a screen on the stage. Cartoons as we'd never seen them before some in colour most in black and white and the celebrated flick of the Harlem Globe Trotters who had us spellbound while they did the same tricks as last year. Curly and Meadow Lark were pure magic. We all went home with a goody bag and half a crown (12 1/2 p); bear in mind half a crown was equivalent to a trip to Hucknall Baths and a tanner to spare. What a way to start the festive season. In my schooldays the Welfare had good and bad memories but looking back they were really all good. In Mrs Brown's class we had to do Country Dancing with the girls to a long playing record which would never appear in the top 50, well at least not after 1949. After the humiliation of all that our macho mindedness took another swipe. The school Christmas play. My appearance was as a Spaniard with black hat and cape along with an embarrassing dance to rapturous applause to redden my face. I still have nightmares about that and Mrs Fanny Brown; so I will probably tell all this to a Psychiatrist some day? My next encounter with the Welfare came in the form of St John Ambulance Cadets. Every Monday night we attended First Aid classes where we would mummify our mates and learn bandaging methods for all sort of catastrophic injuries a human could withstand. We did actually learn some important stuff but not often put into practice except for the odd bleeding nose. Our instructors were from the Brigade and Mr Sharpe, Mr Mitchell and Mr Aniss unofficially called Charlie, Bo and Doug taught us all we knew to get our certificates which never came. The benefits were good apart from practising drill for the parades we went to Skegness and Rhyll on weekend camps and the Skegness day trips. It did help when I started at the pit, we had to take our First Aid tickets and I was well clued up on the subject. As I grew up and followed my ancestors down the pit despite being told I was never going to work down the pit; well that was until I took home a really poor school report in the 4th year. So at 15 years of age I rightfully obtained a Welfare membership card. 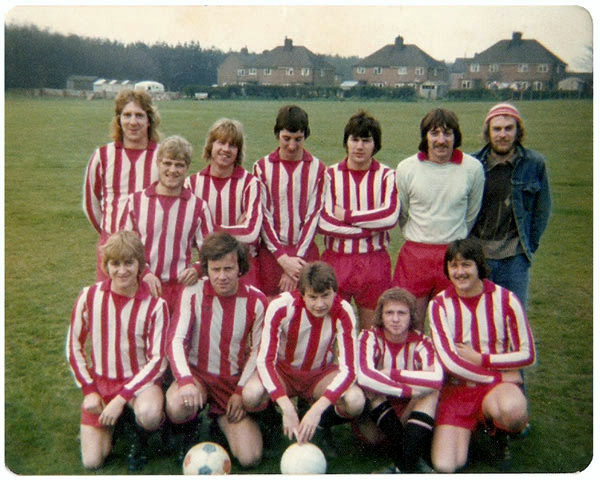 Underage drinking was pretty rife back in the early 1970's lads working with men and also wanting to drink like them so occasionally we ventured into Annesley Welfare for a pint of Home Bitter. My dad's regular drink was Home Brewery Bitter, I suppose like father like son. We that is Neil 'Nobby' Sharpe, Steven 'Rube' Beardsley (son of a miner), Dennis 'Teada' Johnson and Philip 'Pip' Barratt did Annesley School the Annesley Pit (except I worked at Newstead) then it was time for a pint in Annesley Welfare. We used to keep out of everyone's way around the partition of the tap room next to the dart board and snooker table. We would spend a few hours each week playing any of these games or cards when there was no other entertainment around Kirkby or Hucknall. It was also our meeting place before going to Nottingham or Mansfield for nights out at weekends and dinner times to meet before a Forest game. Our faces became as regular as those on the (unofficial) Committee table or Giro table. No explanation needed as how they got those names. Every now and again we would upset one of the older regulars and as we would stroll up to the bar that dreaded question from the Steward, "Are you 18?" Depending on who was around at that particular moment a blatant lie or a meek truth would emerge from your mouth and whichever answer we always seem to get our tap stopped temporarily. Mine came in awkward circumstances. My dad was in the tap room before going into the dance hall and George Dunstan one of the kindest Stewards asked my dad if I was 18 years old. At only 17 years four months I looked at my dad as if to say give him the right answer and he will believe you and my dad said, "No"
Damn it why did he tell the truth? My only answer was "OK make that a Coke" my dad turned to me and said you'll have to go to Kirkby or the Badger Box until your old enough, doh! No malice and we didn't grass on any other under 18's among us just accepted it respectfully from our elders. It was Sid Buxton a neighbour who grassed me up for no particular reason I had never given him any cheek, mind you I'm glad now that me and Paul Williams broke his kitchen window with a dagging top when we were kids and didn't say anything. Why? Because he was up at the Welfare having a pint at the time we ran away and hid the whip and top. The Welfare was mainly just a midweek haunt for us who were now coming of age and working unsociable hours. Racing in for the last couple on Afters or leaving at drinking up time on Early Day Shift. Some nights were good for all ages, like New Years Eve's or entertainment nights. Before my time it was notorious for fighting whenever pop groups played there and that ruined chances of a regular Disco in our era, darn Teddy Boys spoiled it for us. However the regular 'dance' nights kept my mam and dad in there, I think they termed it 50/50 and old time dancing. Every Welfare in the county had these nights and they were the bread and butter nights for our elders. I used to go and see my mam and dad down the dance hall and offer to buy them a drink as I was a big money miner on the coal face at the time, they always refused but I just went to a have a brief chat to their friends before we left to catch the 84 bus to town. We knew how to behave around our elders but I slipped up just that once when Ivy Davies (Mrs Davies to our generation) decided I was old enough to dance and grabbed me and the next minute I was dancing around the floor with all the old uns. OK I endured the embarrassment but my mates came to the door, ready to go to the bus? . . . arghhh! No? Looks like Roey would sooner be old time dancing...... and I had to endure the ragging for many a year. Ivy after that expected me to have a dance every time I showed my face in there and to the delight of my mates I, out of respect, had to comply. "Are you catching the bus to Nottingham or having a night in the dance hall?" kind of jibes. Many a festive night in there went down well and the occasional Christmas kiss would lead to more but that would be telling. Entertainment wise the Hall became redundant except for specially booked parties and weddings and eventually the Old Time dancing disappeared with our forefathers. The beers of the day were Home Brewery and Mansfield Brewery but politics and buy outs have led us to drink whatever the big companies want us to these days. Miners and Welfare Committees could, in a way, dictate to the local Breweries and in turn the best beer was found in Miners Welfares the rubbish was sold in night clubs and town pubs. A pint of Home Bitter in the Welfare and then hop onto the 84 bus for Nottingham and the next pint in the Milton's head. Home Bitter again but not as we know it. As miners we all paid so much of our wages to CISWO who governed the Miners Welfares beyond Committee rulings. It was our welfare in a way and if the Bitter or Mild was 'off' then something was soon done. "To Duh Tommittee" many a time you could walk in and he wouldn't bat an eyelid but another time he would attack you, pulling you back to show your card or sign in. Now being an old man a lot of us held back from giving him a good hiding and for a bit of devilment we used to get our own back by playing him up. The evil eyes beneath a bush of overgrown sage brush eyebrows would pierce you as he demanded your card. Sometimes you could hold a bus ticket up and say you were a member of Bentinck and he would fall for it. I was a member of Newstead but was allowed to go into any other Miners Welfare as an associate member and I even struggled to get in once until rescued by a Committee man. George's other job was to collect glasses. Once the lights flashed he would be round our table first. His fingers would delve inside your glass even if you had some beer left, I often wanted to throw up after that action. His usual threat was "Come on, tup your beers" then he wasn't responsible for his actions as he tried in vain to clear our table. We would hide our glass until he had gone but he would still come back a minute later. Stewards sympathised with us at times but the regulars of the Giro and Committee tables just smirked while he bothered us and not them. Some unknown believed to be Phil (oops) put cling film across the toilet seat once but we never saw the results thank god but it did not deter George. Our favourite was to tell him he had never worked at the Pit and he took the bait, waffling on about his days at the pit. I reckon he could have been dangerous at one time of day and not the baffled evil old fossil he was then.